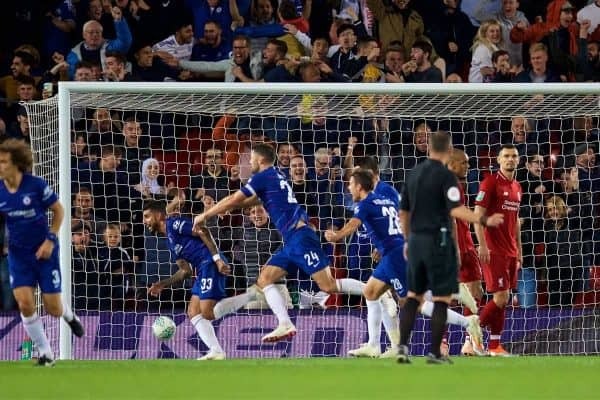 Eden Hazard struck in style as Chelsea fought back from a one-goal deficit to end Liverpool’s winning run with a 2-1 loss in the League Cup third round. On the back of sealing their best-ever start to a season with Saturday’s 3-0 victory over Southampton, the Reds took on another big challenge in the League Cup. After suffering defeat to Leicester City at the first time of asking last term, Jurgen Klopp was looking for a more productive domestic run from his side this time out. Standing in Liverpool’s way, however, were Maurizio Sarri’s Chelsea, who arrived at Anfield for the first of two back-to-back games between the pair. Though the priority remains the league and Europe, this presented a must-watch clash in the third round, and a barometer of the depth in both squads. Klopp made eight changes from the weekend’s record-breaking win, and it showed despite a valiant effort—as Chelsea edged past them and into the fourth round. Two of those brought in by Sarri and Klopp tested their opposing goalkeepers early on, as Andreas Christensen sent a header at Simon Mignolet, before Naby Keita fired a shot into the palms of Willy Caballero. A Liverpool back five that had, bar Joel Matip, previously not played a minute of senior football this season, struggled to settle, and Alvaro Morata almost took advantage on 17 minutes. Kevin Friend waved away a penalty shout on the half-hour, with Keita rightly adjudged to have dived in the area to squander a rare opening for the hosts. Keita, who was the brightest of Liverpool’s forwards in the first half, drew a brilliant save from Caballero as he cut inside onto his right, as the game came closer to an opener. Sadio Mane almost found the far corner with a header after great work from Daniel Sturridge and Xherdan Shaqiri, but the two sides went in at the break at 0-0. 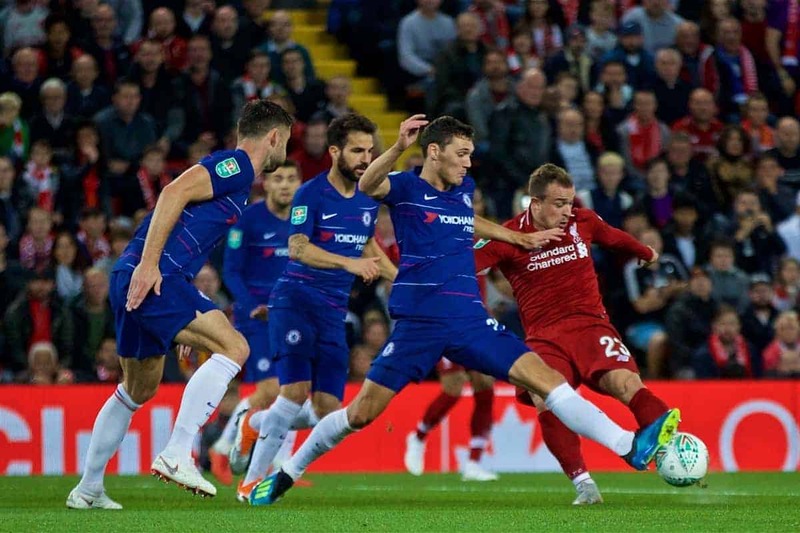 Liverpool were handed a gilt-edged opportunity on a platter just 30 seconds into the second half, as Christensen’s sloppy pass saw Sturridge through one-on-one. 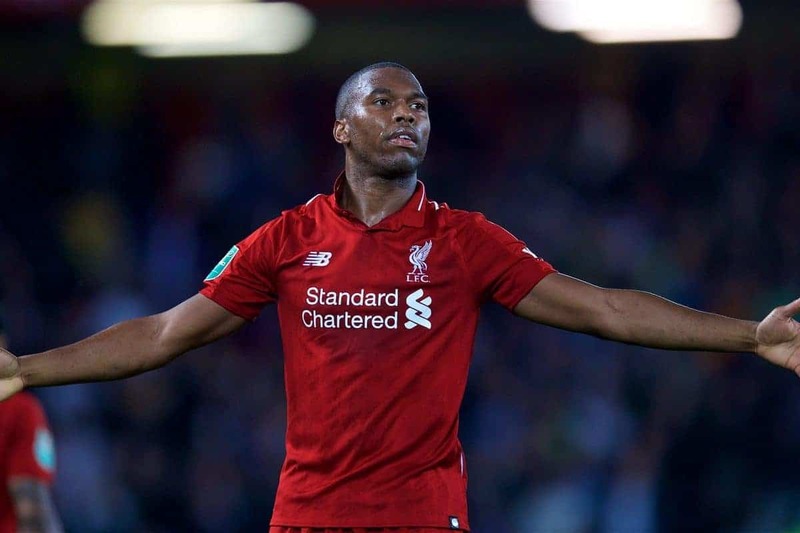 Sturridge did the difficult part by turning Caballero, but the veteran striker then shanked wide with his weaker right foot with an open goal gaping. Another mixup, caused by an awful header from Ross Barkley, gave Mane a similar opportunity, but the No. 10’s effort was blocked. Sarri reacted by sending on his talisman, Hazard, but it was his former team-mate, Sturridge, who eventually broke the deadlock with an overhead kick after Keita’s shot was saved. Chelsea struck back through left-back Emerson, who poked home the equaliser after Mignolet made a fine save to deny Barkley’s header—surviving a VAR review. And a moment of pure inspiration from Hazard, slaloming through the Liverpool defence and powering the ball past Mignolet, sealed the win for the visitors, and the Reds’ first loss of 2018/19.